We live in a visual culture. Images help our brains connect to and retain information and ideas. “An infopic pairs a picture with text and is designed to communicate a message.” (1) As we study a Bible verse during a worship service, Sunday School class, small group gathering, personal study time or other occasion, we can create a “Bible verse infopic” to both deepen our own reflection and learning about the verse, and also share the verse with others to whom we are connected on social media. A variety of smartphone apps and websites are available which can be used to create and share InfoPics. While you can take photos yourself for InfoPics, it’s often useful to find copyright-friendly images online to use. By “copyright-friendly,” I mean photos others have shared online with advanced permission for re-use. Creative Commons licenses are often used for this purpose. By using CC-licensed images, and especially websites which include required author/photographer attribution credit at the bottom of the image, we can adhere to the letter and spirit of U.S. copyright law while taking advantage of the creative photographic efforts of millions of other people around the world. Here are two basic workflows the author currently uses to share Bible verse InfoPics. In upcoming weeks, video screencasts demonstrating these steps and techniques will be added here to further assist you in learning how to create and share Bible InfoPics. Tap the verse you want to share to select it. You can select more than one verse if desired. Verse(s) selected will be underlined in the app. 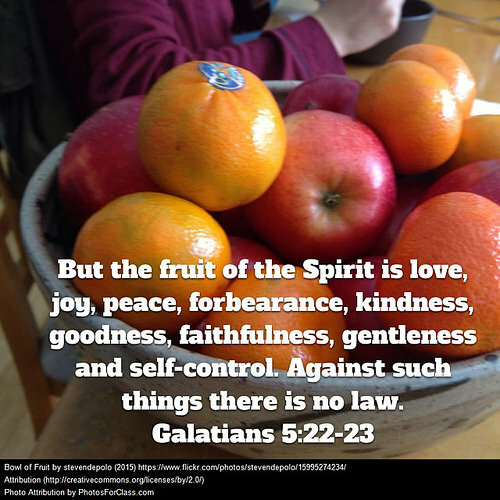 Choose the menu choice IMAGE to created a related image about the verse(s). Select a photo or image you have previously saved to your smartphone photo roll, or choose one of the provided images in the app. This image will serve as a background picture for your infopic. Edit the text, size, color, font, and alignment of the selected Bible verse(s). Choose a color which contrasts with the photo background. Move and resize the text box, if needed, so the words of the verse(s) are clearly readable. When you click DONE, the Bible verse infopic will be saved and shared within your YouVersion Bible app account. Choose to SHARE the image outside the YouVersion community, posting it to your Instagram, Facebook, Twitter, Pinterest, or other social media account and website. Some social media platforms, like Twitter, limit the number of characters you can use in a single post. 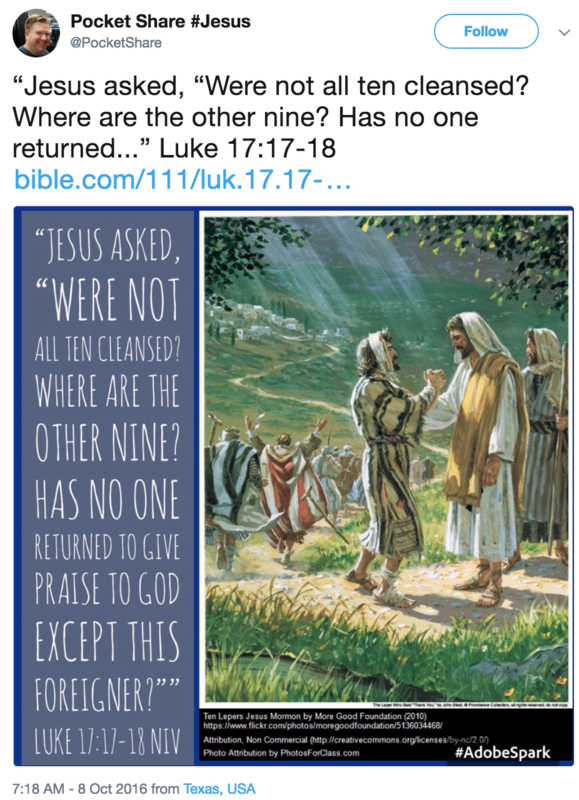 In these cases, your entire Bible verse can be included on the image you share, but you will need to reduce the number of words and characters of the verse shared in the actual post. 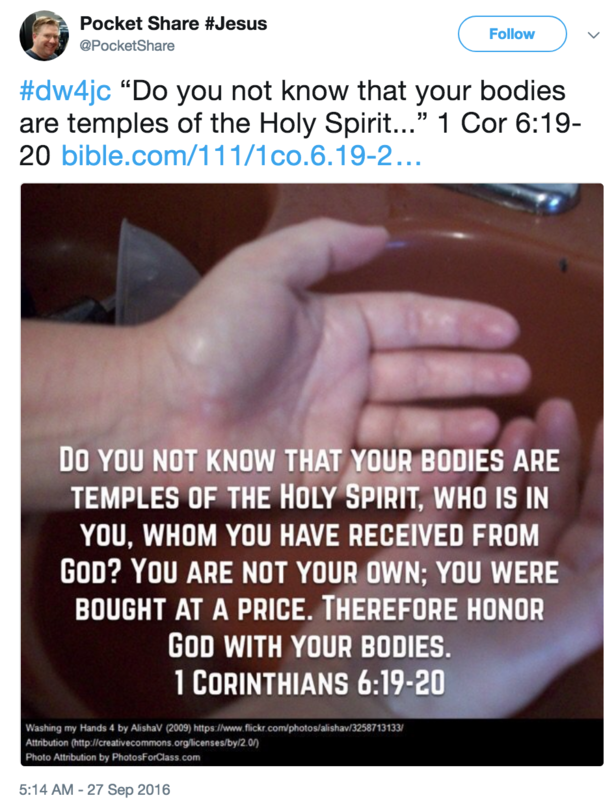 As a technique, the author likes to start a Bible verse infopic with the hashtag #dw4jc (to insure it’s included in the tweet) and then follow with as many words from the verse as can fit within 140 characters. At the end, it’s important to still include the verse citation (book, chapter, and verse) as well as a link to the verse online. This enables others to easily link to the specific verse you have shared, to read it again or in the larger context of its chapter within the Bible. As you are starting out and experimenting with Bible verse InfoPics, you might just share online using a single account, app, or website. Eventually, however, consider cross-posting your InfoPics several places. You never know where or when someone is going to stumble across one of your InfoPics which is going to speak directly to their heart, in their current situation in life! Remember that God prepares the hearts of his people to receive and be open to the transforming power of his Holy Word and Holy Spirit. As reformed believers in the Gospel of Jesus Christ, we understand that it is God who does this work in the hearts and minds of his people, not us. We are called to be God’s witnesses and messengers of his Good News. Remember God’s Word is alive and it is powerful! God has the power to melt and transform the hardest heart, and He acts on his own timetable rather than ours. We have the important job of sharing and telling others in our lives and in the world about God, because their eyes may be shielded from seeing and recognizing the work of God in their lives. By testifying to God’s actions in our lives, specifically and verbally giving God credit for the blessings and strength he gives us each day, we can point others to Jesus. While our own observations and ideas about God and Jesus can be important and valuable, it’s always a good idea to directly share the words of God from the Bible. As we do, these words can more deeply impact our minds and our lives, and potentially intersect with and influence the thoughts and actions of others too. Find a Bible verse (or verses) you want to share using an app like the YouVersion Bible. Copy the verse(s) to your device’s clipboard. You will use this copied text later in step 4 below. Visit a website like www.photosforclass.com or unsplash.com on your Smartphone or tablet using a web browser. 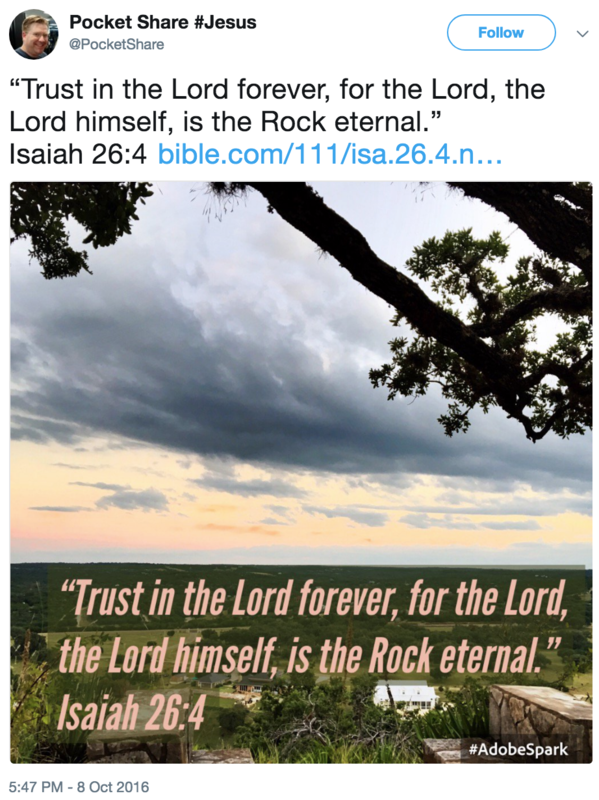 Search for and find an image which relates to your selected Bible verse, and tap to download the photo. PhotosForClass includes author/photographer attribution details at the bottom of each image. Save this image to your smartphone/tablet photo roll. Open the Adobe Spark Post app, and choose to create a new post from your image library. Select the image you saved in step 2 above. Alternatively, use a photo you have taken with your smartphone or tablet. 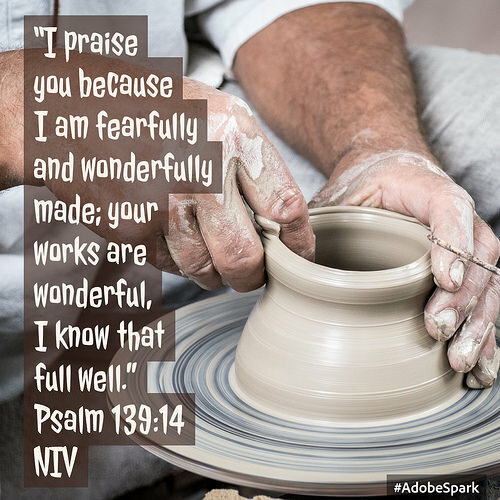 From your device’s clipboard, paste the text of your selected Bible verse(s) on top of your selected image. Choose a font style, font color combination (including font background and foreground colors), and size which makes your selected Bible verse(s) easily readable and visually pleasing. Save your final Bible verse infopic to your camera roll and share it on one or more of your social media channels. 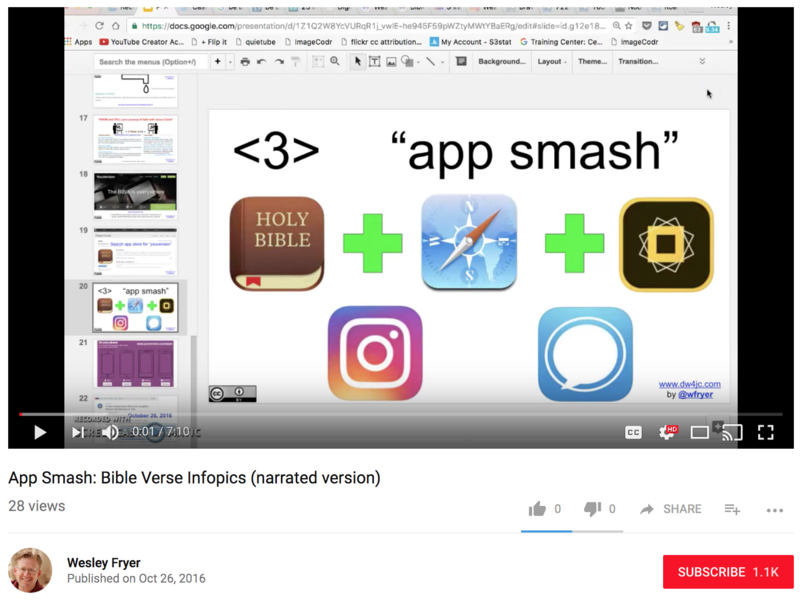 A 7 minute narrated video screencast tutorial is available (wfryer.me/ps1), demonstrating these steps to create Bible InfoPics. A 104 second, 4x sped-up version (wfryer.me/ps2) without audio narration is also available. Remember to share your Bible InfoPics with the Twitter hashtag #dw4jc! 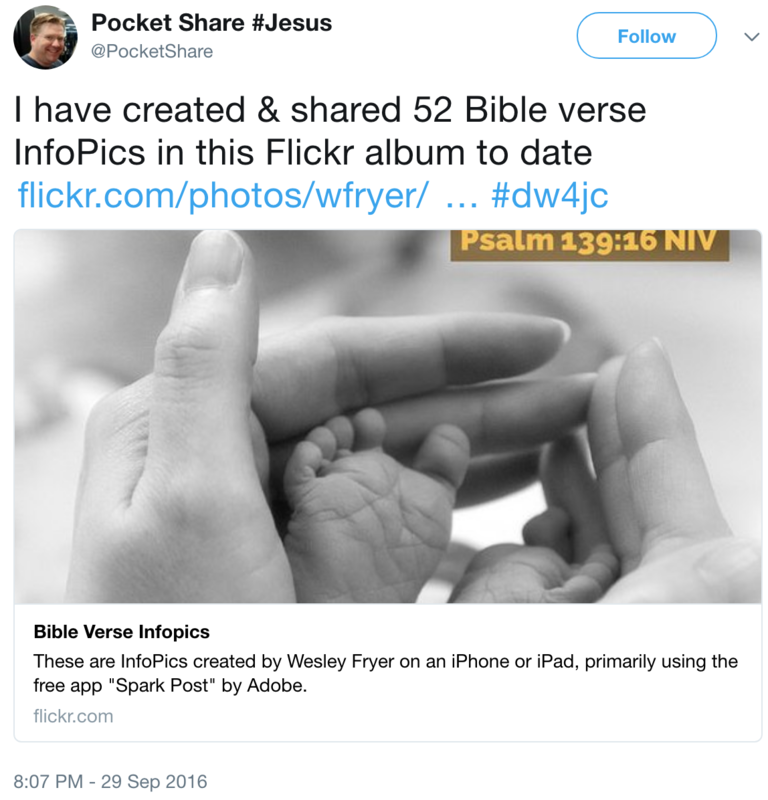 Please also reach out to the author with a Twitter reply to @pocketshare and/or @wfryer to let him know if these suggestions and instructions have been helpful to you in creating your own Bible verse InfoPics!